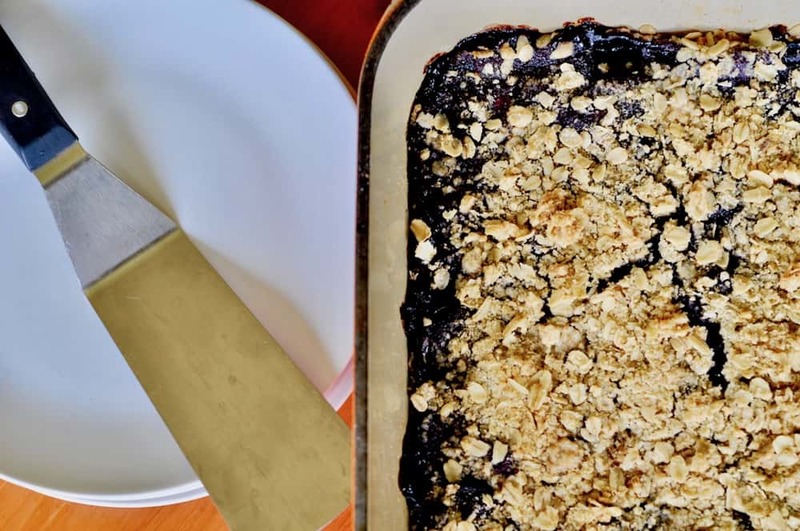 You guys, these Blueberry Oatmeal Bars are one of the best things to come out of my kitchen this summer. And I’ve been busy! I made them like my famous Rhubarb Oatmeal Bars but tweaked the recipe to accommodate the pleasant sweetness of the blueberries. And because blueberries are hot in the stores right now, you can quickly whip these up for back to school lunches. Or make a batch for a coffee date with friends, because these are JUST like coffee house cookie bars. In the rhubarb recipe, there’s a lot of sugar. Well not actually a LOT of sugar but enough to make rhubarb sweet. 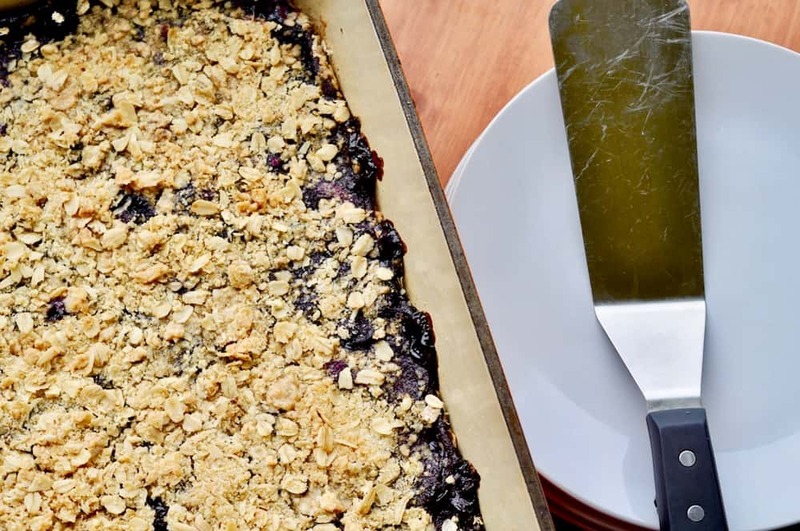 In this recipe, I cut the sugar because blueberries are so naturally sweet. I also added some lemon zest to make the blueberry flavor pop. I like lime too, and it works as well as lemon just replace the lemon zest with lime. A note on Wild Blueberries: Yes you can use wild blueberries in this recipe. You may need to increase the sugar; I will note in the recipe directions how to tell and where to add that. I made a pan of these ostensibly for lunches. We snacked on them for a couple of days and still had enough to make up bags for school lunches. It’s so nice to have a 9X13 pan of bars, just enough for snacking and making lunches. Do be aware that the top layer will get softened when in a baggie or take-a-long dish, they still taste AS good so don’t worry about that. Wondering what to take to a coffee hour at work or when having friends over for coffee? These bars are just like those four dollar bars you see for sale n the coffee houses. Except you’re making a massive batch of them. Pretty much coffeehouse food you can whip up at home. 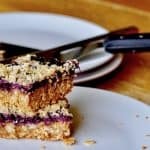 This recipe for Blueberry Oatmeal Bars makes a 9x13 pan full of Blueberry Bars, perfect for lunches or enjoying with a nice hot cup of coffee. 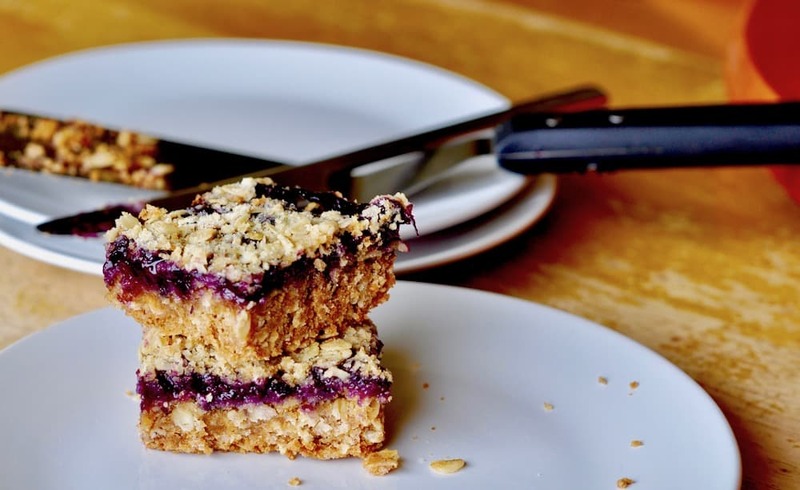 Crunchy bar on the bottom, tempting fruit filling, and a light crumble on top, what could better? The blueberry with a little pop of citrus sounds amazing! I wish I had one in my lunch box today!